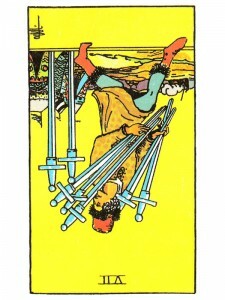 Seven of Swords (R) says listen carefully now – someone may be offering you the advice and help you need. Your situation isn’t half as bad as you “think” it is. You will always have something returned if you do not neglect good advice. Stop sabotaging yourself – release this “yes – but” attitude. You KNOW what you want – stop trying to convenience yourself that you can not have it. Move through this negative thinking – focus on listening to your “inner” voice and this isolation will turn into communication. Seek advice on what to do about your problems. As valuable as specific instruction is – just as important is your readiness to listen and seek help through the “act” of finding help – a reader, a therapist or even a friend. You alone can decide which course – independence or seeking advice – will produce the best results. Open your mind, release the blocks – free your imagination and satisfy your curiosity. Inefficient editing of our mental track record – cutting out too much or leaving too much in. Perfectionist to a fault. There may be plagiarism, professional jealousy, extreme exaggeration or lying. Improper application of the intellect in general – hiding your thoughts from others. What is your strategy to achieve your ends? What research are you doing? What ideas are you collecting? How are you maneuvering the outcome? What can you do to drop your defenses and become more open? What are the weaknesses in your plan, research or work? Next to Fool: You are too changeable and inconsistent – be more positive. All the Sevens in the spread: This is an important point in your life – a major cycle change. You will be starting over under new conditions. Next to Nine of Cups: You will receive what you want – but not necessarily in the “way” you want. In the first position: There is much hard study and dedication required here but no more than your soul is capable of embracing with enthusiasm. In the second position: Check all of your information vaults to be certain this commodity is secure from any man made or natural disaster. In the third position: Be certain that the mind is properly engaged. Is your information correct? Allocate credit where credit is due. In the fourth position: Knowledge for knowledge’s sake has many wrong forks which will take you far from your soul’s true goals. This love, like all others, must be a means to an end…which then becomes a means…and so on. In the fifth position: There may be mental retreat, a regrouping. You may be aware of some inaccuracy or untruth. In the sixth position: Your penchant for truth must be handled delicately, not like a mace to punish others for their lack of comprehension or in-authenticity. In the seventh position: In one extreme there can be fear of knowledge itself, a sensing of what you would rather not believe, in every day affairs or in the headier realms of metaphysical reality where knowledge made you face the work of your Karmic Contract. In the eighth position: Such changes to work or residence, if proper, will seem obvious and need not be forced. Do not play with information or its sources to support predeterminations. Let the information speak for itself. In the ninth position: The process of thanksgiving must be complete before any new invocation can be heard. In the tenth position: This may be a major fork wherein you choose consciously a lesser fork than would take you more directly to your life purpose. The young man is removing all the swords but TWO, evening out the “playing field”.